I Can’t Get Up From the Toilet! We have provided a quick overview of the options for enhancing the height of the toilet seat below to help aid you in identifying which solution will best work for your home and needs. Another option is to add a toilet seat riser underneath your existing toilet seat. Toilet seat risers are typically attached by means of the toilet seat bolts. They are available in different heights, averaging somewhere between 2 to 4 inches in height. Most models are a fixed, immobile round or oval-shaped ring. 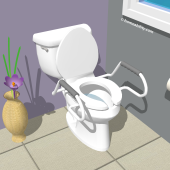 Some toilet seat riser models are equipped with a hinge allowing them to be flipped up out of the way by male members of the household. Toilet riser models exist both with and without handles. Ones with handles will help provide you with extra leverage, making it easier to stand up from the toilet. If you do select a toilet seat riser with handles and you have wide hips, confirm the distance present between the handles will be adequate for your needs. This option is similar to the last one, however, there is one key difference: Instead of inserting a riser underneath your existing toilet seat, this one requires removing the existing toilet seat and replacing it with a toilet riser that doubles as a toilet seat as well. Elevated toilet seat models are available in different heights, averaging somewhere between 4 to 6 inches in height. Toilet seat risers that double as a toilet seat vary in the manner in which they attach to the toilet bowl. Some models have a few inch lip at the bottom that nestles down inside the toilet bowl to prevent if from sliding around, some have a clamping mechanism to attach it to the toilet bowl walls, and some get attached to the bolts at the back of the seat. The latter type are typically the most secure. Elevated toilet seats are available with or without handles. The models with handles will help provide extra leverage, making it easier for you to get up from the toilet. If you do opt for a model with handles and you have wide hips, confirm the space present between the handles will be adequate for your needs prior to ordering. 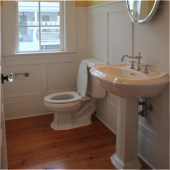 Another alternative is to place a toilet frame (aka commode or portable potty) over the top of your toilet. Most toilet frames are equipped with a seat with adjustable height legs that extend down below. The adjustable height legs will typically allow for a seat height range somewhere between 18″-23″ high. 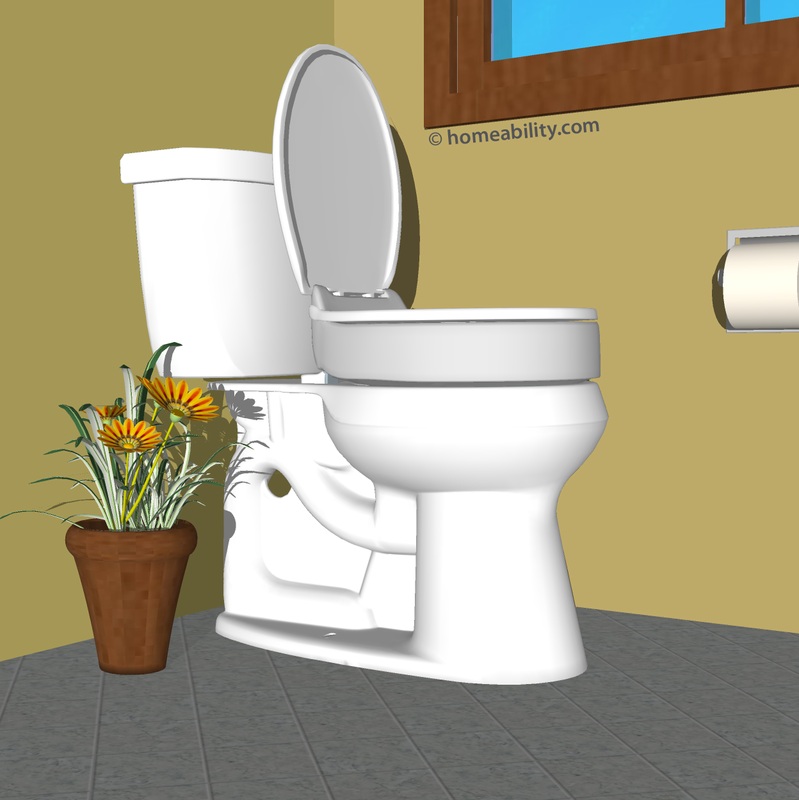 Most models include a hard-plastic liner that gets inserted between the commode and the toilet to ensure all contents go directly into the toilet and do not splash out the sides (since the commode seat will be higher than the existing toilet bowl). Some models are equipped with drop away arm rests allowing a wheelchair user to slide from the wheelchair’s seat directly to the commode seat. Some models have a padded seat, which can be helpful for persons with pressure-sensitive skin. Foldable models exist too, making it possible to take the toilet frame along with you when you are traveling or to easily hide it away when guests are visiting. Yet another option to enhance the height of your toilet seat is a mechanical toilet seat lift. Mechanical toilet seat lifts are specially designed to assist you with standing up from the toilet. Some have springs or a pneumatic lifting mechanism that provides some added support as you begin to stand up. Others rely on batteries or electricity and can fully assist you in moving from a seated to a standing position. Models will vary in the maximum seat height they can achieve. 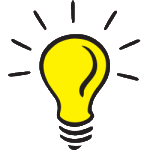 Some electric models can raise the toilet seat up to 26″ tall. A few toilet seat lift models are equipped with wheels, which are helpful if you are someone who has trouble walking to the bathroom. The wheels make it possible for a caregiver to push you into the bathroom seated on the chair and then position the chair over the top of the toilet. The standing mechanism then helps to make it easier for you to stand up for performing hygiene and for standing to pull pants down or up. Determining which type of solution from the list above is right for your needs is the first step. Next it will be important to confirm that all of the features for the specific model selected are appropriate for your needs, prior to ordering one. 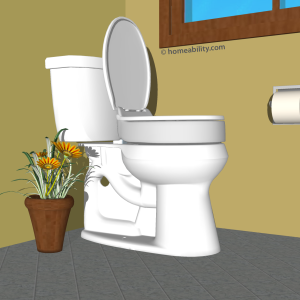 Shape of Toilet Bowl: If you plan to install a tall toilet seat, toilet seat riser, or elevated toilet seat, confirm the model selected will fit the shape of your toilet bowl (round or elongated). Width of Handles: If you plan to install a toilet seat with handles fixed to the seat, or plan to add a toilet frame or a mechanical toilet seat lift, confirm the the space present between the handles of the model you select will accomodate the width of your hips. Width of Equipment: Confirm that the width of the equipment will fit in the allotted space where your toilet resides. Height of Toilet Seat: If you are seeking to substantially increase the toilet seat height, the elevated toilet seats, toilet frames, and mechanical toilet seat lifts are a good consideration. Many of them will allow for a much greater toilet seat height than the toilet seat risers and tall toilet seats. Weight Capacity: Elevated toilet seat models will accomodate differing weight capacities, so it is important to confirm it will accomodate the weight limit you require. Some toilet frames can accomodate a weight capacity of up to 1000 lbs. In general, options that attach to the bolts at the back of the toilet seat or have legs that extend down to the floor will typically be safer and more stable than models that are attached to the toilet bowl via a clamping mechanism. If the solution you select for enhancing the toilet seat does not include handles, adding a grab bar beside the toilet or toilet rails can further enhancing ease of moving from sitting to standing. Due to FDA regulations toilet equipment (I.e. toilet seats, risers) purchased in the USA cannot be returned unless it is still sealed in the original packaging. Therefore, it is important to confirm the height, weight capacity, and features are appropriate for your needs prior to purchasing! A Walk-in Bathtub – Your Biggest Mistake? 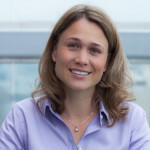 Home Modification Funding: Does Any Exist?